If you follow me on Twitter, you may already know that I had an eBay Freakout recently. If not: Sooooo... I had an eBay Freakout recently. I've been buying old issues of Cricket magazine. AND I CAN'T. STOP. Ahem. Sorry about that. Anyway, they've been such an utter joy to go through that obviously I felt that I should share. 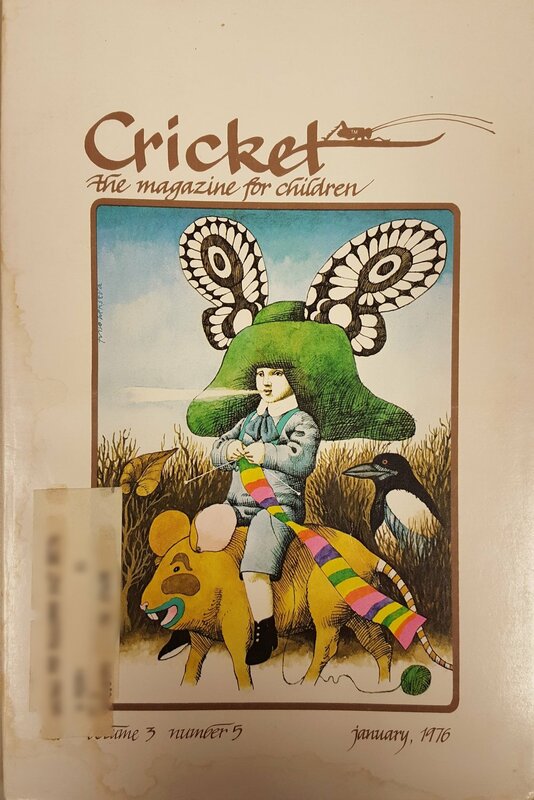 If you're not familiar with Cricket, it's a children's literary magazine. Short stories—sometimes serialized over a few issues—and nonfiction and poetry and how-tos and cartoons and a crossword puzzle and letters to the editor and writing and art contests, it has it all. Example of the gang having some fun in the bottom margin of page 76. Page fourteen of Cricket, January 1976; Leave Me Alone! by Felice Holman, art by Edward Gorey. Excerpt from page twenty-six of Cricket, January 1976; buggy marginalia in response to A Toad for Tuesday by Russell E. Erickson. Is this not the most late-70s illustration to have ever late-70s? If Marylin Hafner's style looks familiar, it's probably because of this. Or this. Or this. Or any of the other eighty bazillion books that she illustrated. From the Letterbox: A letter from 12-year-old Diane Rubenstein from Athens, West Virginia, who was clearly Ahead Of Her Time: "I like to think of sentences with words that are also letters, such as I C U and R U O K."
Mr. Breton filled a bowl with creamy clam chowder and set it on the floor. The moose dipped his big nose into the bowl and snuffled up the chowder. He made sort of a slurping, whistling noise. "Sir," the moose said, "this is wonderful clam chowder." Mr. Breton blushed a very deep red. "Do you really mean that?" "Sir," the moose said, "I have eaten some very good chowder in my time, but yours is the very best." Paul's Tale, by Mary Norton: THIS STORY IS CREEPY AS ALL GET-OUT, GOOD LORD. It's a little bit Princess Bride framing story, a little bit sociopathy of small children. I don't see it available for sale on its own, but it appears to be included in this late Borrowers volume. From Meet Your Author: Mary Norton: A great well-we-don't-see-that-anymore-70s-moment, in which Mary Norton lists her Special Vice simply as "Smoking." But how do we know exactly what the girls and Branwell imagine? We know because Branwell writes it all down in a book he calls The History of the Young Men from Their First Settlement to the Present Time. It is the only book of his that is ever published. LOLOLOL, as a friend recently pointed out, the Best Burns are the True Burns. Cameron goes on to recommend a book ABOUT the imagined later life of the Brontës' wooden soldiers called The Return of the Twelves by Pauline Clarke. OBVIOUSLY I put in an ILL request for it. They walked for many days through Asia and Vietnam. There was a war in Vietnam and Burton heard some missiles coming. As they jumped out of the way, he said to Dudley, "We better split before we get drafted." After one year of walking and floating through many countries, Burton turned to Dudley and said, "I'm bushed, let's go home by Up Up and Away, TWA." You're probably thinking, Yeesh, Leila, that is a LOT of highlights for one issue of one magazine! Welp, what can I say? THAT'S CRICKET FOR YOU.